In many cases the eyes have grown visible shoots up to a few centimetres long, despite being in the dark. Whereas Carl Rogers might have seen this as an inspiration towards understanding the ineffable desire of beings to live and grow to their full potential, I, in my more humble status, see it as an opportunity to....grow more potatoes! That's right, those old, squishy potatoes are just offering a way for you to get more FOOD literally from WASTE. One of the best ways to be eco-friendly is to simply use less. And a great way to use less is to waste less. So, stands to reason that turning rubbish into food is a worthwhile thing to do. And I am going to tell you how! So, that squishy old potato at the bottom of the bag. Take a look at it. You will see that it likely has several “eyes” that are waiting to sprout (or have already begun to do so). You want to cut the potato into roughly four pieces, each one of which will need two or three “eyes” to sprout from. Next, leave the pieces to dry off for a day or so. Then dig a hole in some earth. Literally any earth will do, but if you have some compost you can dig in all's the better. You can grown potatoes in a container, in an old bin bag, in the ground, pretty much anywhere that is about a foot and a half deep. Ideally with potatoes you can bury them relatively shallow, sprouts facing up, and then as they shoot you pile more earth around to encourage more baby potatoes. However, if you don't do this, don't worry, you will still get more potatoes than the one you were going to throw away. Plant the pieces about 6 inches apart. After a week or two the potato will grow a stem with leaves, it will get to about 60cm tall and will usually flower. When the plant starts to wither away you can check and see if there are some potatoes. Just put a fork around the edge of the plant and gently lift up the earth until you find some. You can then put the plant back down if you want to keep the potatoes outside until your next meal. Any you don't harvest will likely grown new plant at some point! The best time of year to do this is early spring, but really you can do it any time of year other than winter and still get some results. 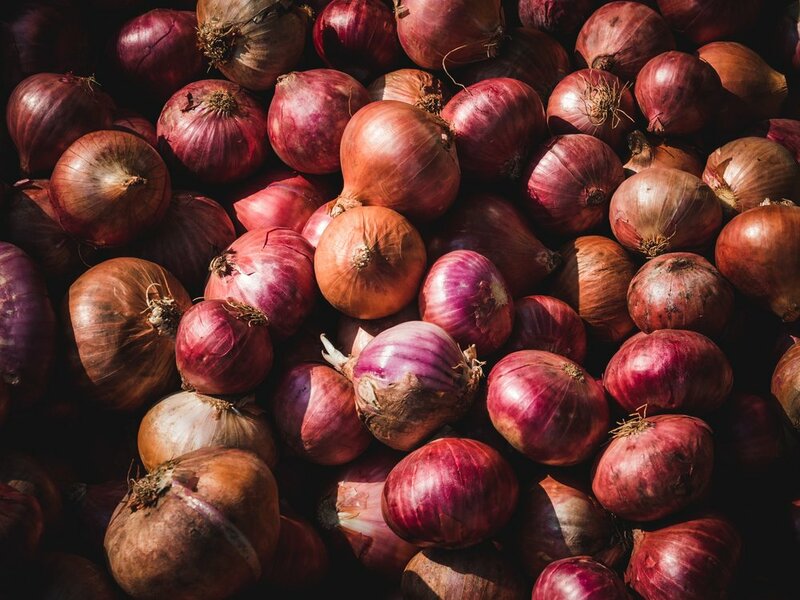 Onions that have started to grow leaves and gone a little soft are not so good for cooking but perfect for planting. The best thing to do is to take away the outer layers and get to the plump round bit in the middle, keeping the green shoot and as much root in place as possible. Sometimes you will find that there are two or more plump parts in the middle, which you should separate and then you will get two new onions instead of one. Pop them in soil about a hand's width apart, and about 5 or 6 inches deep. They don't need much depth at all and will grow more above the ground than below it, so containers on a patio are fine. They need to be well draining or they will rot. If you only want the onion greens then you can even grow them on a windowsill, but are unlikely to get enough sunlight this way for a full bulb. They will take longer to grow into new onions than the potatoes, up to about 6 months. You can just scrape away some soil and check if they are ready and pop them back under if not. That last mushy strawberry that no one wants.... mash it up with a fork and then pop it through a sieve or a tea strainer to get the seeds. Run some water through the sieve to clear away the remaining pump and you should be left with some seeds in the strainer. Spread the seeds on a paper towel to dry. 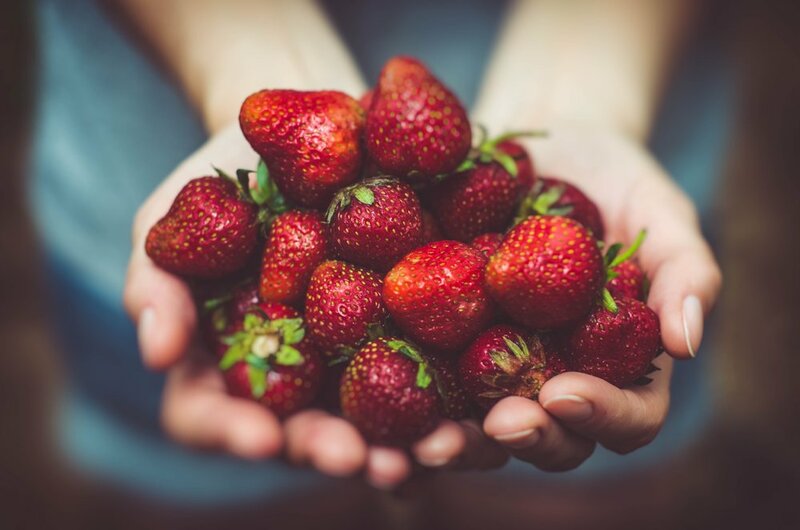 Plant the seeds in a small container – you can use compost in an old egg carton, yoghurt pot with a hole pierced in the bottom, old plant pot, the skin of half a lemon or orange, or the container that the strawberries came in. Place them on a sunny windowsill and keep the soil moist. In 2-3 weeks they should germinate. When they are large enough to handle, thin them out if necessary and plant outside somewhere sunny. Keep them watered and eventually they should flower and fruit. These all grow if you put the bottom part in a dish of water on a windowsill. After a few days you should see roots begin to appear. Plant them out into soil and you should get a new plant to eat. I've never done this as we always seem to either eat the ginger or it's gone mouldy before we have done anything with it! But I understand that ginger is very easy to grow. Simply plant a piece of the root in shallow, potting soil in a container with drainage and keep it somewhere sunny indoors. Keep the soil moist but not too wet. The ginger should begin to sprout – apparently it is quite an attractive house plant and you can harvest some of the rhizome as needed once it has sprouted, keeping some for the next time. I really must do this myself!